The Golden State has more to see than most countries, and it’s the same size, as well. With so many different landscapes from forests to the deserts, mountains, and coastline running along the entire western side, I’ve spent most of my life exploring this state and still find new points of interest constantly. San Diego is the third largest city in California and probably has the best weather of anywhere in the world. Given its proximity to Mexico, you can plan on some of the best food in the state and a nice mix of cultures, though that’s true all over California. The beaches of La Jolla, Coronado Island, and the funky culture of Hillcrest make these areas my personal favorites. Pacific Beach is a favorite of those in the 20-something crowd and Ocean Beach is a laid-back surfer hippie spot. On your way north, stop by Encinitas for even more of a hippie vibe, and the free Self Realization Gardens. If you’re super into surfing, you might already know about the famous waves of San Onofre. Book your stay in San Diego here, or book a cute Airbnb! Font’s Point in Anza-Borrego must be the best sunrise in all of California, where sunsets usually reign supreme. The incredible rock formations and wind caves are super fun to explore, too. If you are camping, don’t forget to look up at night. Anza-Borrego is great for stargazing. I can’t say enough great things about this beautiful park! It’s only a 2.5 hour drive away from Los Angeles, and best visited in the winter. Book your stay near Anza-Borrego Desert State Park here! I first went to Slab City to see the Salvation Mountain art installation, only to find that Slab City is actually a community of squatters and outcasts using what’s been left behind and rejected by others to create a free society that operates nearly independently of the rest of the world. It felt like entering a new dimension. The art installation alone is worth the long drive into the middle of nowhere. It was created by US Army veteran Leonard Knight, a devoted Christian who expressed his dedication for Christianity through art, though I’d say anyone regardless of religious affiliation would find the installation appealing. If you’d like a unique experience, rent a camper van and drive towards the last free place in America. Find a unique Airbnb in Slab City here! If you enjoy hiking and love stargazing in the wilderness, Joshua Tree is perfect for both and beyond. It is also the only place that you can see Joshua trees, which are actually agaves, a succulent plant.. This national park is famous for rock climbing and bouldering as well. Just be careful in the summer months. It can get blazing hot. Book your stay in Joshua Tree here, or find a unique Airbnb here (like this awesome airstream). Have you heard that the sunsets are better in Southern California? They’re brilliant with explosions of orange, red, pinks, and sometimes even green flashes as the sun hits the watery horizon. What better way to see the OC sunset than on a helicopter ride? If you depart from John Wayne Airport in Newport Beach down the coast, and fly all the way to Dana Point and back, you will pass by Laguna Beach, Corona Del Mar, and other iconic landmarks. Seeing these places soaking in the golden hour glow is a beautiful and unique experience I highly recommend when in Orange County. I also highly recommend watching the sunset from the Newport or Balboa piers in Newport Beach, where I lived for four years. Other favorites of mine are Laguna Beach and riding a bicycle from Newport to Huntington for some great exercise. There’s even a drum circle at the Huntington Beach pier on Sunday evenings if you’re into it. Book your stay in Orange County here, or find a unique Airbnb here (like this cool treehouse!). This one’s a classic. I grew up about 15 minutes from Disneyland and had a parks pass for most of my life and still never got tired of it. It’s so nostalgic, sparkling clean unlike other amusement parks, and the food is honestly really good. You can also get beer and wine in California Adventure if that’s more your speed. Even as an adult, I still love the Magic Kingdom. Big Bear Lake is a mountain resort town in the San Bernardino mountains that frame Greater Los Angeles. It has been a ski town since 1925, and is the first place where I strapped on a snowboard. It is perfect for skiing enthusiasts of all levels, in fact, many come to Big Bear Lake to learn to ski for the very first time. There are two mountains to choose from – Snow Summit and Bear Mountain, though I’d say go for both if you can, since there’s a shuttle between the two. You could also snowshoe and sled in between. Book your stay in Big Bear Lake here, or find a gorgeous cabin on Airbnb here. There are so many incredible hiking trails to choose from! You will be sure to find one that best suits your ability. Big Bear Lake also has many campgrounds and RV parks, so if you plan to spend the night, consider camping out – gear is available for rent, and the facilities are great. Serrano Campground is the most popular area for both tent and RV camping. This hike surprises some people given the steepness and exposure to the elements, but it’s a great way to see the whole city from one of the most iconic landmarks in LA. The hike is just over 6.5 miles with over 1700 feet of elevation gain. Prepare for a workout and go in the early morning or later afternoon hours if attempting in the summer. As always when hiking in California in the summer, be aware of snakes, particularly rattlesnakes. I encounter them all the time in the dry summer months. Book your stay in Hollywood here, or find a beautiful Airbnb! Venice Beach is a classic LA stop if you love places that are just a little bit weird. Stop by the skate park, get an overpriced coffee on Abbot Kinney, and watch the sunset on the sand. If you’d rather go less weird and more classic, stay in Santa Monica and watch the sunset near the pier as the Ferris wheel lights up. Alternatively, stay in Silver Lake for a hipster vibe close to the famous Sunset Blvd, or in West Hollywood if you want more of a party vibe. If I can talk you out of even visiting the Walk of Fame allow me to try – it’s the worst part of LA and so overrated. Stick to the beaches or Silver Lake instead! Book your stay in Venice Beach here. Airbnb is ruining the local housing market in the area, so please stick with hotels in the area. Covering 1.6 million acres, the Mojave Trails National Monument is the largest national monument in the contiguous United States, with the Mojave National Preserve, next door, huge as well. There’s plenty of cool things to do, but personally, I think the sand dunes come out on top. Yes, you don’t have to travel all the way to Namibia to see the sand dunes – I was so pleasantly surprised to have found them back home! It’s nowhere near as popular as the sand dunes in Namibia, but the experience was just as impressive, minus the crowds. Hiking up through the loose sand can be pretty tiring, but the panoramic view you get from the top is absolutely gorgeous. You can glide down slowly after taking in the views. I recommend going barefoot for this. The sand dunes are incredible at both sunrise and sunset, and are accessible with a normal, non-4 x 4 car as long as you stay on the tar road and don’t continue onto the sand. Book your stay in Mojave National Preserve here or camp in the preserve itself. There are sites just at the base of the dunes, however they don’t have any services like showers, toilets, or running water. Please pack everything out. The Badwater Basin, which sits below sea level, makes up a large part of Death Valley National Park and is incredible for stargazing, or during a full moon. It’s a flat and easy walk out to them from the main viewing area and from there you can go as far as you please. It’s the lowest point in North America located in the hottest desert in the world, so if you’re visiting in the summer, do so after dark. Book your stay in Death Valley here, or find a unique Airbnb here. The Alabama Hills is the gateway to Mt. Whitney, the tallest mountain in California as well as the highest summit in the lower 48. The jagged formation of the mountain makes it a beautiful sight, especially when covered in snow. It’s got gorgeous arches, beautiful views of the Eastern Sierras, and lots of Hollywood history. Both Mobius Arch and Boot Arch were a highlight during my recent California desert road trip! The best time to enjoy the Alabama Hills is in the winter or the spring. In the wintertime, you can see snow on the mountain tops, and sometimes snow in the Alabama Hills themselves, whereas in the springtime, there are swaths of wild flowers in bloom. Book your stay in Alabama Hills here, or find a cozy Airbnb here. The Central Coast is my favorite part of California, beginning with Santa Barbara where I attended college (I’m a UCSB Gaucho for life) heading up to San Francisco via Big Sur. This is one of the most popular parks in California, and usually books up well in advance and for good reason. 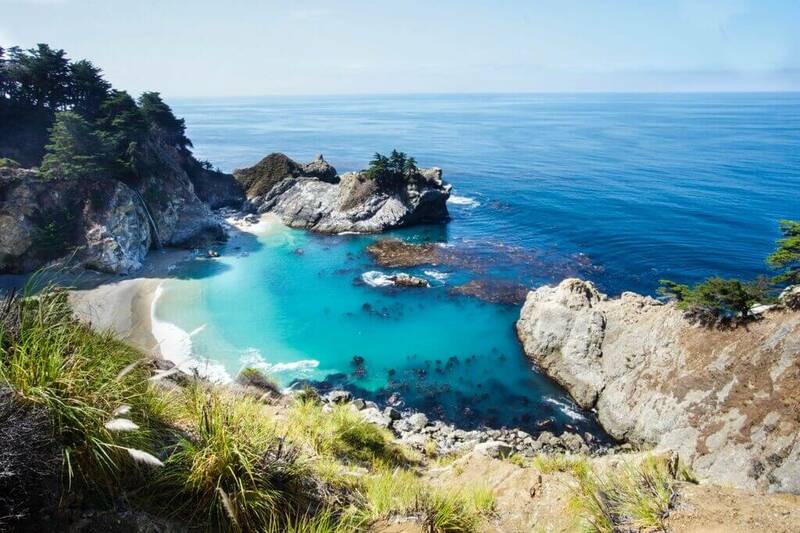 You will see incredible Coastal Redwood trees, and of course, find the unique McWay Falls, standing tall at 80ft, flowing directly into the ocean when the tide comes in. It is a gorgeous spot you don’t even need to hike to. Just park your car outside of Julia Pfeiffer Burns State Park and walk over. Finally, no Big Sur road trip is completed without a stop at the infamous Bixby Bridge, which makes the perfect ending to your Big Sur adventure as you head north to Monterrey. Book your stay in Big Sur here, or find a cute Airbnb here (like this cozy riverside studio!). 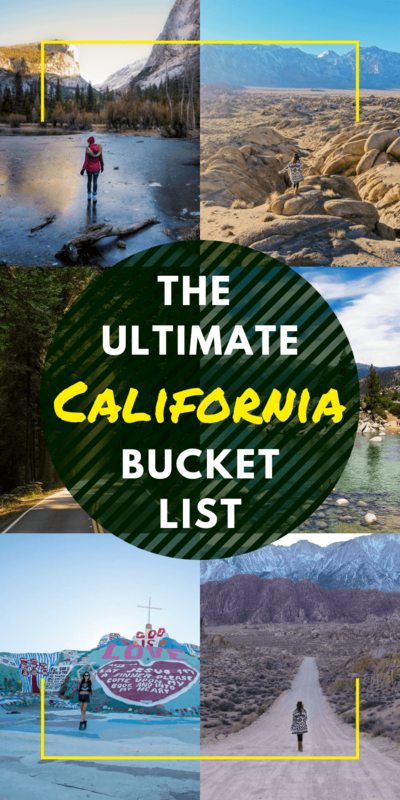 Heading back inland, you’ve got the trifecta of California’s most famous national parks including Yosemite, King’s Canyon, and Sequoia National Parks. Sequoia is famous for the world’s most massive trees. It’s incredible to see such old living organisms, without being able to see all the way to the top in many cases. One of the most iconic landmarks in San Francisco, if not all of the US, the Golden Gate Bridge is best explored on foot and in the morning. You can walk across the bridge, and take a short walk to the Golden Gate Park with beautiful gardens afterwards (perfect spot for a little picnic!). Another option is to rent a bike and ride across the bridge. 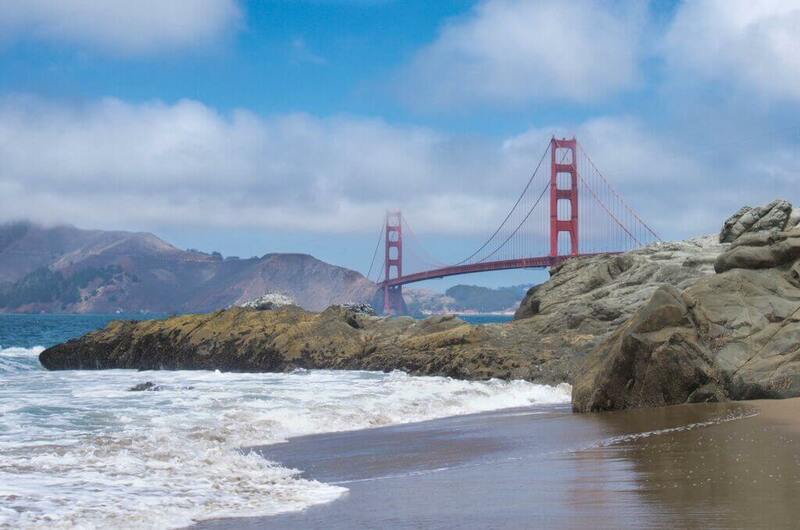 If you want to see it from afar, I suggest heading to Baker Beach, which is a nudist beach. Once you’ve got that perfect selfie with the bridge as your backdrop, there are plenty of great restaurants and cafes around to fill your belly. As cool as San Francisco is, don’t just stick to the normal Fisherman’s Wharf and Painted Ladies. Check out Chinatown for some seriously good food, make your way to Oakland for live music or Ecstatic Dance. It’s easy when you can BART and UberPool or Lyft Line all around the Bay Area. Just south of Yosemite and on the other side of the Sierras from King’s Canyon, be sure to check out Mammoth Lakes for some of the most brilliant stargazing, waterfall chasing, and skiing in the winter. I loved hiking there this summer and seeing the glimmering Emerald Lake and Duck Pass pictured above. Book your stay in Mammoth Lakes here, or book a cozy Airbnb here. The crown jewel of California and the first national park in the US, Yosemite is on everyone’s bucket list when they visit California, and it should be! You can have a fantastic time in the valley, but if you want to avoid the crowds, I suggest camping in White Wolf and sticking to the trails near Glacier Point, which is the perfect starting point for Nevada Falls and different views of Half Dome. That’s only possible to do once the snow has melted, but Yosemite is magical in the winter as well. Book your stay in Yosemite here, or find an awesome Airbnb here! Another favorite for skiing as well as swimming in the summer, Lake Tahoe is located on the border with Nevada and is known for insanely clear water. It’s perfect for standup paddleboarding or hiking. It’s a big lake with a South and North area, the latter of which is the less developed of the two. Book your stay in Lake Tahoe here, or find a cozy Airbnb here. Though I’m not a wine drinker, this isn’t a complete list without mentioning the famous wine regions north of San Francisco. The most famous are Napa and Sonoma. The latter tends to be a bit cheaper and less posh while Napa can be costly but has some of California’s most famous wines. Book your stay in Wine County here, or find a lovely Airbnb here (like this wonderful guest room). You basically can’t go wrong driving north to Humboldt and along the scenic drive between Moonstone and Trinidad and beyond. Each beach is gorgeous in its own way. You’ll see locals walking their dogs, and surfers braving the cold and catch some waves. You can walk along the Coastal Redwoods in Humboldt and north into Redwood National Park. You will see very few tourists, which is always preferred. I love this part of California so much I’ve been back six times. There are several viewpoints as well as great restaurants along the way. Oh, and you might spot some whales, too! Redwood National and State Parks house the Hyperion trees, or better known as the Coastal Redwood trees, which are the largest and and tallest trees in the world. They stand tall at over 350ft, and can live as long as 2000-2500 years. The park remains open all-year, though the best time to visit is in the spring or fall, when the crowds are much smaller. Still, you won’t get nearly the visitor numbers of the geographically lower parks in the state. It’s a humbling experience seeing these giants up close, let alone waking up surrounded by them, to say the least. There are also a number of hiking trails available. If you are into camping, you can camp at the state park campgrounds (there’s no campground in the national park area). While those are some of the best places to see, you can bet there’s so much more beyond this list. As I said in the beginning, California can be an endless adventure with enough adventures to fill a lifetime. What are some of your favorite spots in the Golden State? *Some links in this post are affiliate links. Any purchase you make supports this site at no extra cost to you. I only recommend services I regularly use and love myself. Your trust always comes first. The photo from the Yosemite National Park is awesome! What kind of equipment do you use? Wow- so many great suggestions! I have never been to California but am hoping to go this summer. I was wondering, if you had to narrow this list down to 5 must-see places, which would you choose? This is such an awesome list of things to see and do. It makes me want to go back to Cali someday. I have visited San Francisco, Redwood National Park, Lake Tahoe, and Disneyland, but I’d love to go back and check out some other spots too. Death Valley and McWay falls look particularly interesting to me. If you had to pick one spot to absolutely not miss, what would you suggest? OMG that is so hard! My favorite part of the state is the central coast, but in the winter I’d do the deserts. We’re heading to California later this year for at least 5 weeks (as part of a 4-month road trip throughout the US). 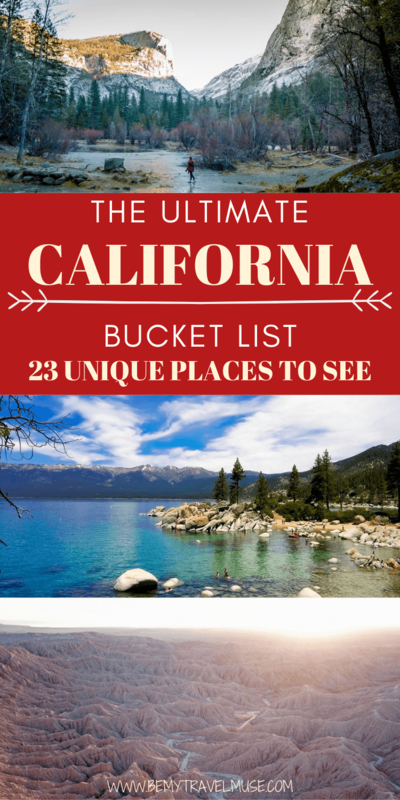 This list has added a few more spots to our bucket list! California really is so diversely beautiful! When you went to Font’s point, did you hire a guide or rent a AWD or 4X4? I had a 4×4 but I don’t see the need to hire a guide.